The 12th Annual Baltimore Comic-Con took place on August 20-21, 2011, and Comics Experience alums and Creators Workshop members were everywhere! At one point, Workshop member, Joey Groah, tweeted that the BOOM! Studios panel audience had "@ComicExperience member overload" because we had so many folks there! Baltimore Comic-Con is a fantastic show for comics creators on both sides of the table, with crowds that seemed record-breaking to us, perhaps due to the appearance of Stan Lee. But the large Artists Alley portion of the convention still allowed for lots of direct interaction with creators. 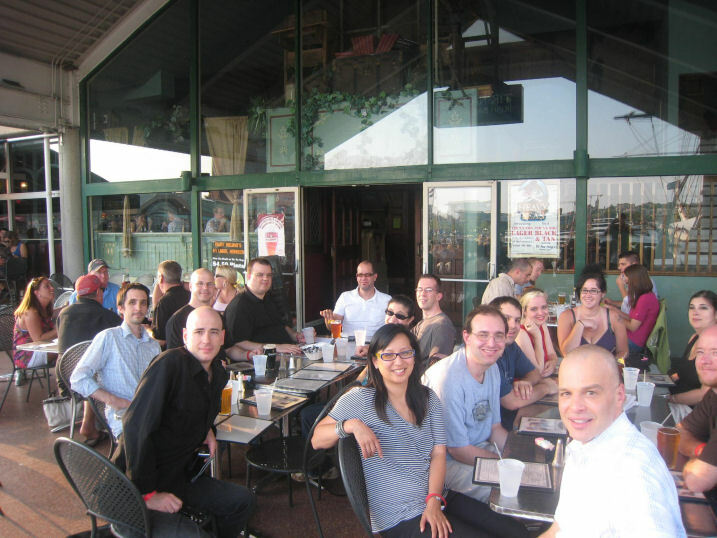 Saturday night, we held a Comics Experience Meet-Up at Tir Na Nog on the Inner Harbor with alums, workshop members, and friends. It was great to have a "real world" get-together with friends who we interact with on a daily basis in our online classes and forums, but don't always get to see face-to-face (unless you count webcams)! As you can imagine, much of the conversation centered around making comics, and it was clear a lot of exciting work is in the pipeline. Members/alums in attendance included Paul Allor, Rob Anderson, James Babbo, Gannon Beck, Amy Chu, Scott Dubin, Janine Frederick, Ken Frederick, Joey Groah, Elizabeth Amber Love, Dan Rivera, and George O'Connor (who joined us after the picture shown here). Thanks to everyone who joined us, and we look forward to the next Comics Experience meet-up at New York Comic-Con 2011! It encompasses the way you feel about yourself, the quality of your relationships, and your ability to manage your feelings and deal with difficulties.Strong mental health isn just the absence of mental health problems. Being mentally or emotionally healthy is much more than being free of depression, anxiety, or other psychological issues. Rather than the absence of mental illness, mental health refers to the presence of positive characteristics. I agree with both Raquel and Paul I think Donner is not insane but has been lead to insanity. He bachelorette party shirts has reached out to you and wolf because he wants you guys volleyball shirts to find out the truth behind the tragic events. Maybe, you guys ( media) can help get enough camera on him when he gives himself up.